Minsk is the capital of the ancient Slavic state of Belarus in Eastern Europe. There have been many changes in these lands over many years, at one time they were called the Polotsk principality, then by the Grand Duchy of Lithuania and the Commonwealth of Poland, which was later annexed by the Russian Empire. Despite the fact that the history of Belarus (White Russia) was diligently erased over the years and replaced by myths, a Slavic state still exists that has retained its own history, traditions, identity, language and culture. 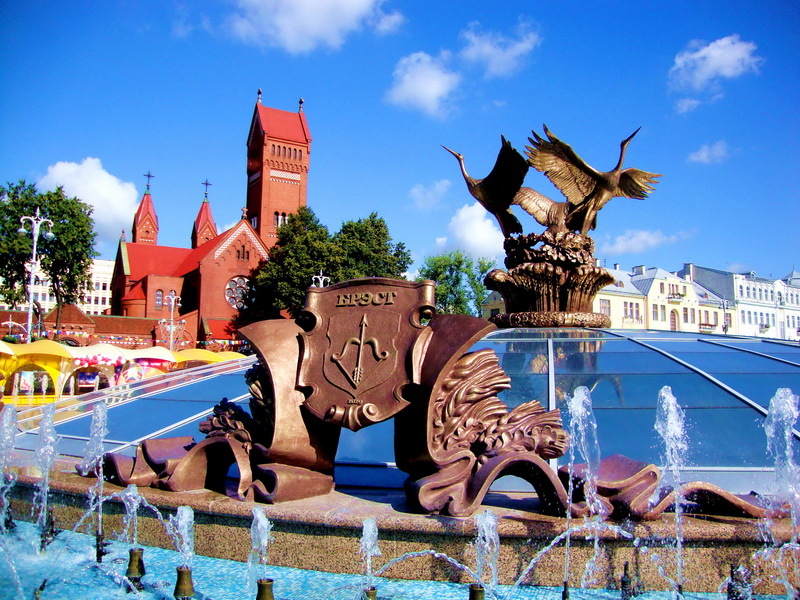 The history of the Belorussian ethnicity began to be formed in the 8th century according to the chronicles of the tribes of Krivichs, Dragovichs and Radimichs. 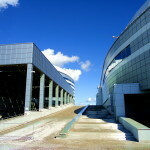 The present day independent state of Belarus has a recent history initiated in 1991 after the end of the Soviet Union. Throughout history the lands of Belarus have been repeatedly subjected to total destruction by many wars . That is why most Belorussian cherish any old heritage that has been preserved throughout the centuries. I love coming here and walking through the ancient and modern streets. I cannot help but admire this city and the many changes it has undergone. 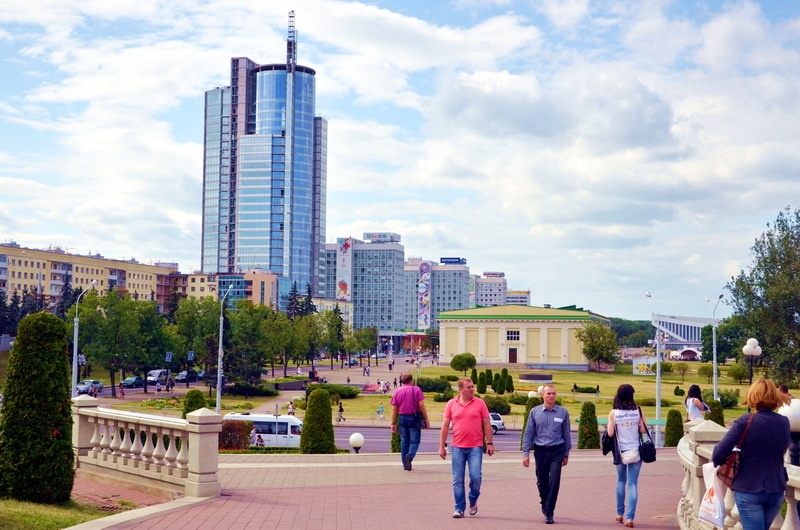 Minsk has always been maintained, groomed and cared for during the Soviet period. Every piece of historic value and old building was and is constantly being restored back to it’s original splendour. Historically, the name of the city comes from the river Menka , a tributary of the Nyamiha river. 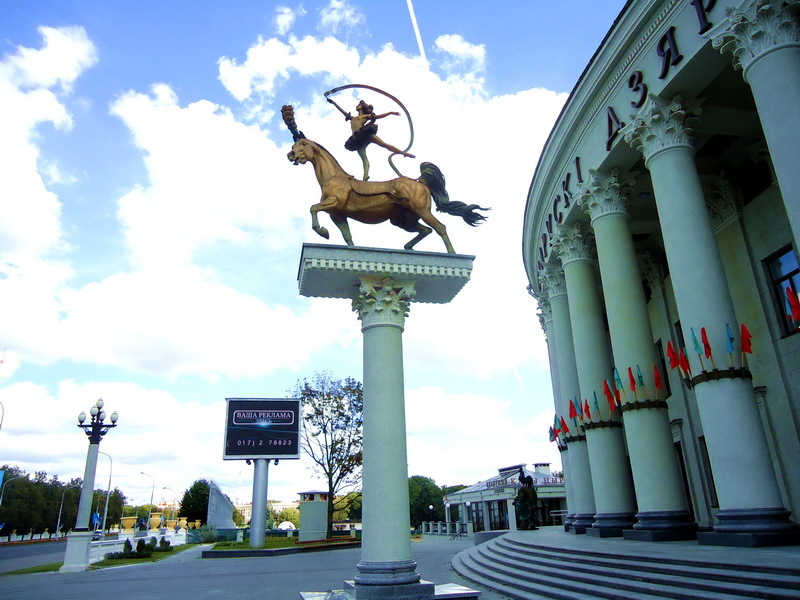 Although legend has it that the name of Mensk was derived from a local hero known as Menesk who built a water mill on the river and organized an army of strong and proud knights to defend the land. 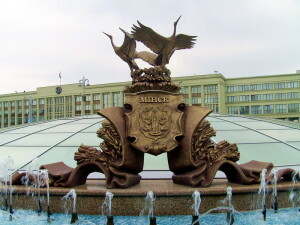 The ancient name of Mensk gradually faded from official records and eventually became known as Minsk. I will now guide you through some of the city streets and the most important historical places. 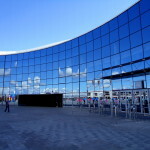 The first impression of Minsk you get is from the railway station. 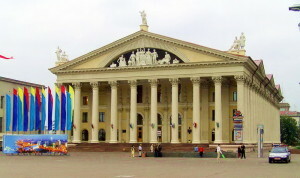 The railway was brought to Belarus in 1862 and reached Minsk in 1971. The Station buildings were destroyed by wars several times but were always rebuilt. 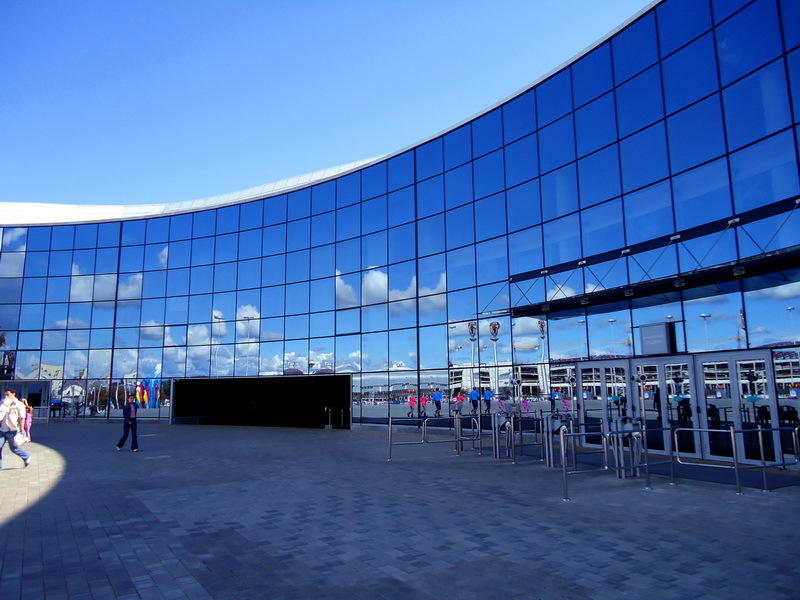 Today the modern station built in 2002, has been declared one of the most beautiful railways stations in Europe. All trains travelling to Moscow from Paris and Berlin pass through Minsk. 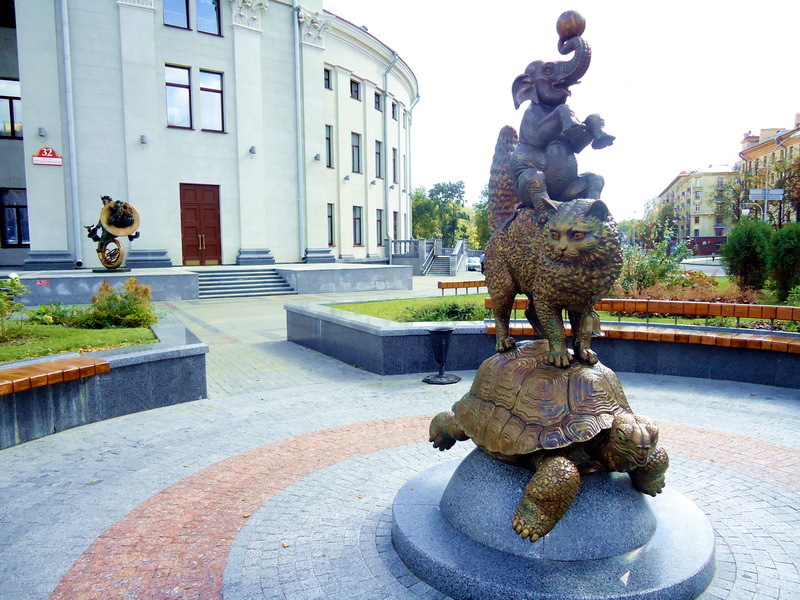 Many years ago, the area surrounding the train station was called Uborki, meaning “next to the forest”. Unfortunately, the forest was totally cut down when the railway was laid in the 1800s. In the 1950-s, two eleven-story identical buildings were built in the classic Stalinist style opposite the station, which are named the “Gate of Minsk”. 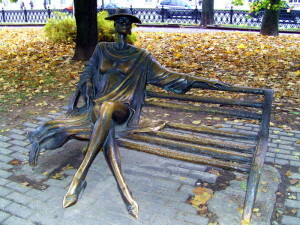 As you pass through them and go along Leningradskaya street, in a near by park you will come across the sculptures of ” The lady on the bench ” and the ” Girl with an Umbrella ” as well as “Monument to Person who offers you a light” (by the way, the model was a businessman Vladimir Golynsky, and the monument was his idea). From here you proceed to Independence Square and then on to Independence Avenue (Niezalezhnasti avenue), one of the longest streets in Europe measuring 17 km. Independence Avenue is also famous for the fact that in it’s history, the name was changed no less than 14 times, the most prominent name was in honor of Francis Skaryna, the first Belorussian printer and historical writer. Indepedence square is where military parades and any demonstrations are usually held. 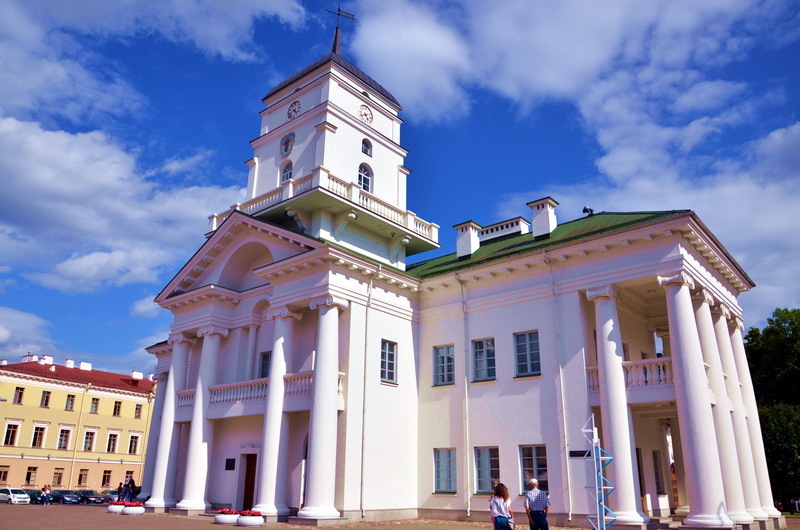 The Government House is sometimes glimpsed in the European news releases, when the country is celebrating important events, such as the presidential election, especially if government security forces attempt to disperse protesters. Recently, the president of Belarus was referred to as the last dictator of Europe. Independence square is also famous for the Catholic Red Church (Cathedral of Sts. Simeon and Helene). It has a very interesting history. 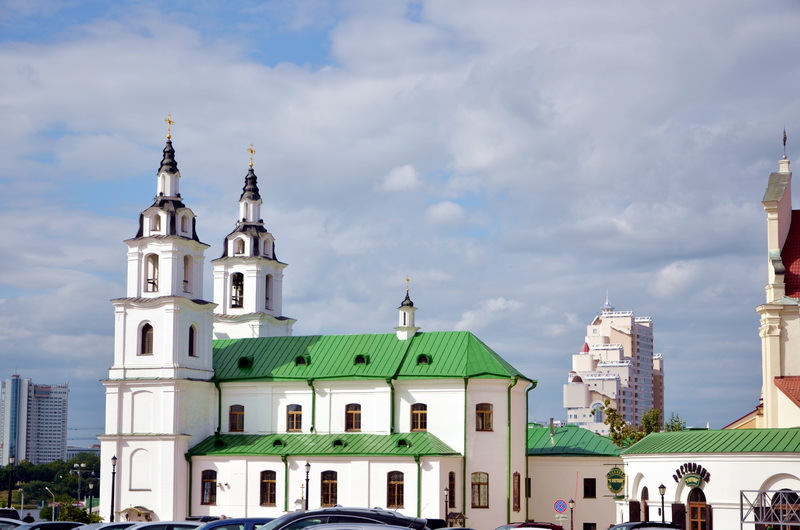 A wealthy nobleman Edward Voinilovich had two children Simon and Helena, he donated a considerable sum of money for the construction of this church and named it Simon and Helena in honor of his children who passed away at an early age. The church was consecrated in 1910. Unfortunately, with the advent of revolution and the Soviet Union, this church was put to many uses. 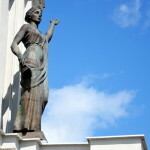 It has been a Polish Theatre, a Film Studio and the House of Cinema. 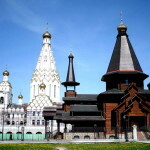 In 1990, the building was returned to the Catholic faith and in 2006 the indigenous inhabitants of this land reburied Edward Voinilovich in the church as a mark of respect for someone who had done a lot for his country. 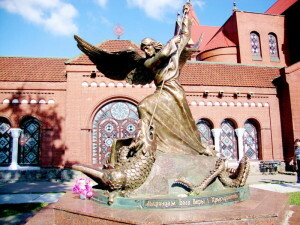 Next to the church there is an architectural composition of the Archangel Michael, the patron saint of Belarus, piercing a dragon with his lance, symbolizing victory over dark forces. 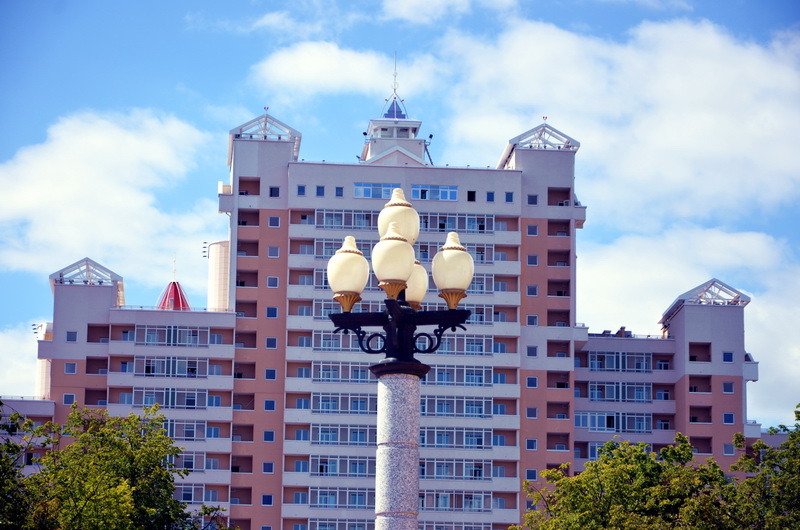 At the beginning of Independence Avenue, there is a building housing the State Security Organization, which is symbolic of the Soviet era. 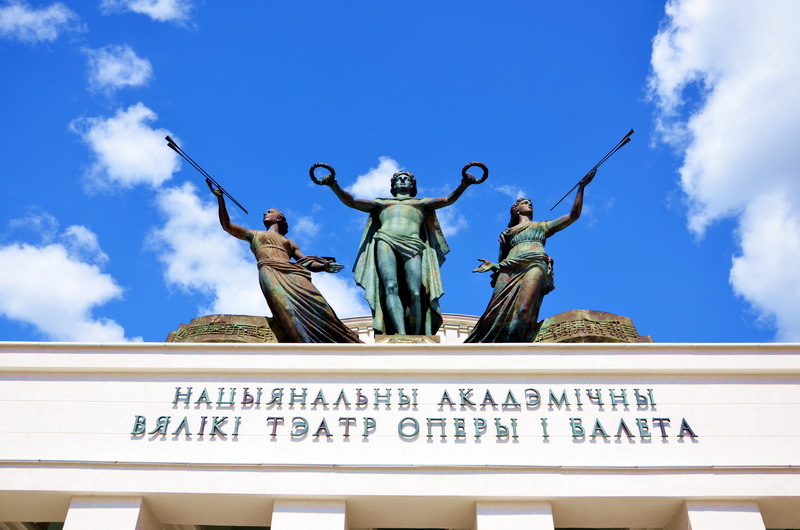 Foreign tourists love using this building as a background on their photos being a typical monument of Stalinizm. 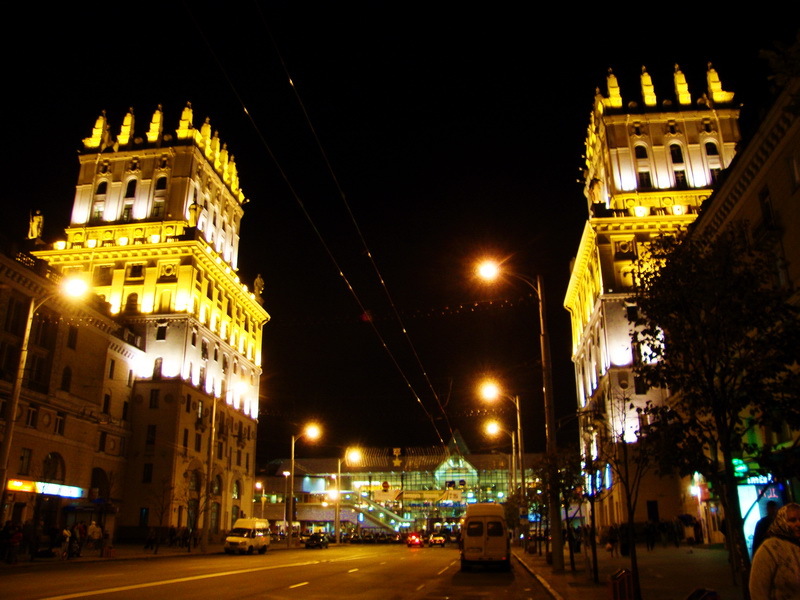 Architecturally, it is a beautiful building, especially at night when it is lit up. 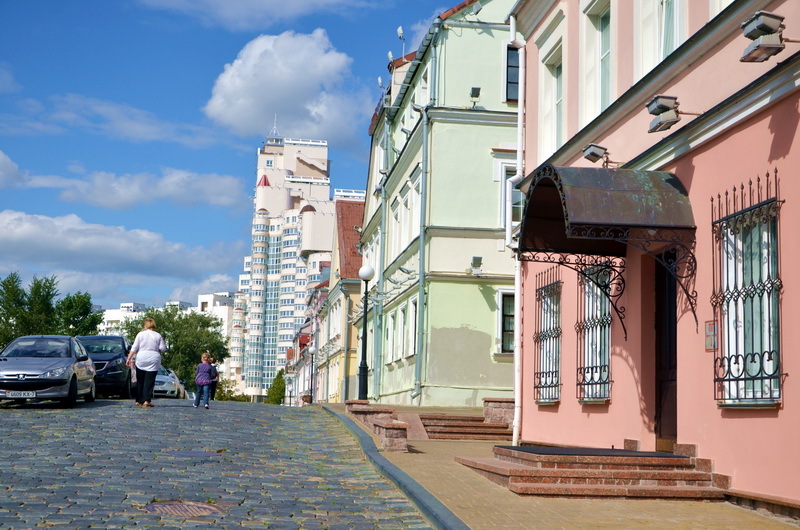 Leaving one of the largest squares in Europe, which is a favorite walking place in Minsk both with residents and tourists alike, you wonder down some historical streets of the city. I was really surprised this year when I noticed that abandoned courtyards and crumbling houses were transformed into a very nice cozy historic areas. The original “Felitsianskaya” Street, later called the “Bogodelnaya”, was renamed “Komsomolskaya” street during the Soviet era. 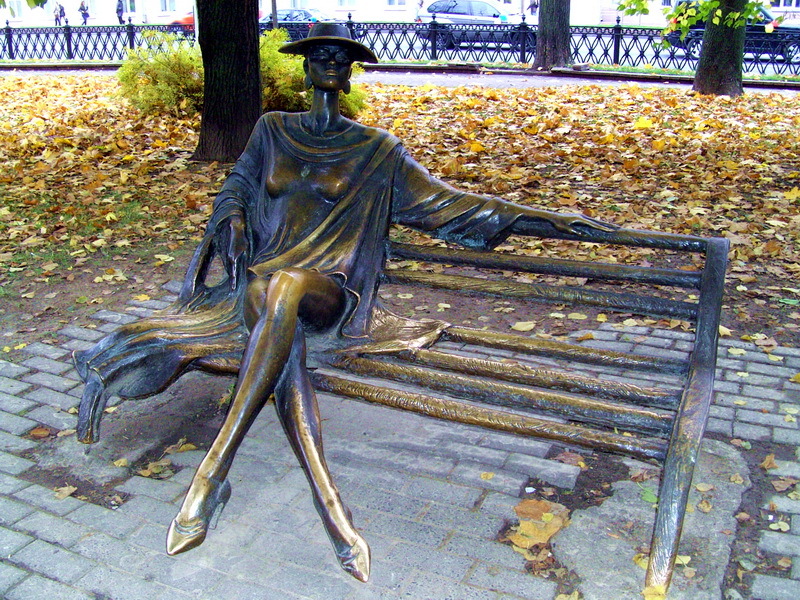 Also “Sborovaya” and “Preobrajenskaya” streets had their names changed to “Internationalnaya”. Perhaps, after they finish renovating these areas, the ancient street names will be reinstated? 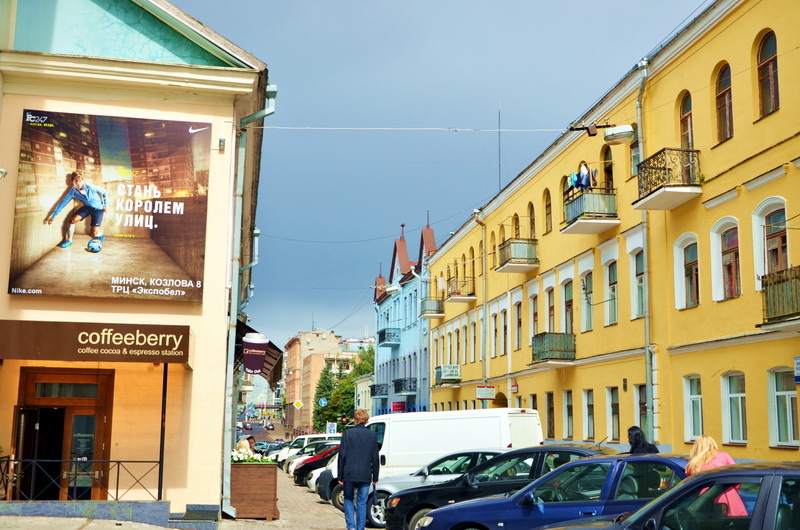 “Lenin” Street may once again be called “Gubernatorskaya”, or “Franciscan” street. For some reason I really like the old names. On Lenin Street, there is a magnificent baroque facade of a Jesuit church, known as the Archcathedral of the Blessed Virgin Mary. This main Catholic church in the city, built in 1710 by the Jesuits, also experienced a lot of changes in its history. Since 1951, it was mostly used by training athletes but in 1993 it was returned to the Catholic faith fully restored and renovated. 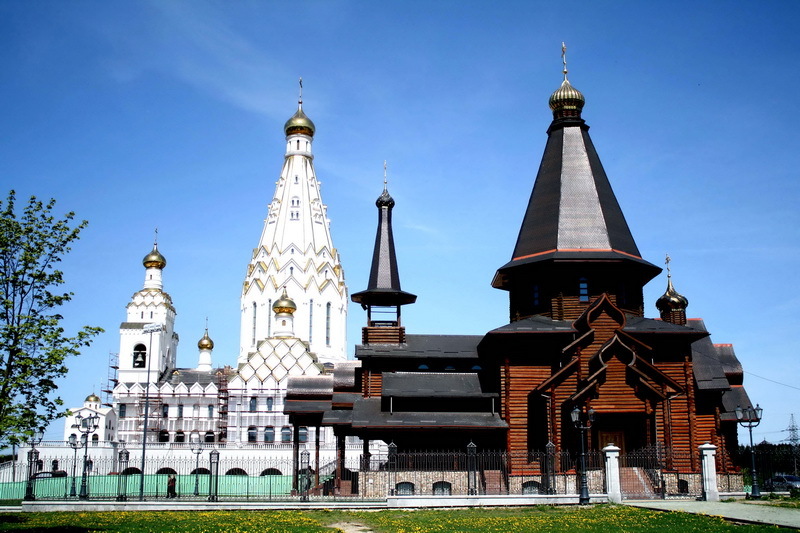 Back in the 17th century the Moscow metropolitan Bishop noted the religious tolerance of the Belorussian. Where many religious orders, like the Lutherans, Calvinists, Orthodox, Catholics, Jesuits, Franciscans and Jews existed peacefully. On the corner of Lenin and Internatsionalnaya street the hotel “Europe” was recreated in 2006 on the site of an existing hotel which was destroyed during the Second World War. 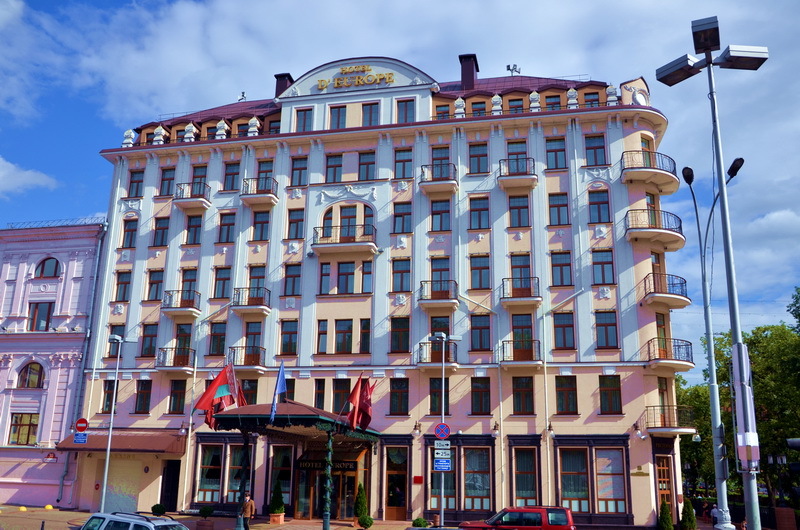 Presidential suites overlook the Cathedral Square (Svabody Square), where the main Belorussian Orthodox Church of the Holy Spirit is situated, it was originally a Catholic church and Bernardine monastery which was destroyed by fire a long time ago. In the 16th century as well as being the cultural center of the city, this area was called the Upper market due to it’s position on a hill where jesters, traveling musicians, performing animals, festive parades and theatrical performances took place. In the 17th century, all the wooden buildings in the Square were destroyed by fire during the war with Poland . 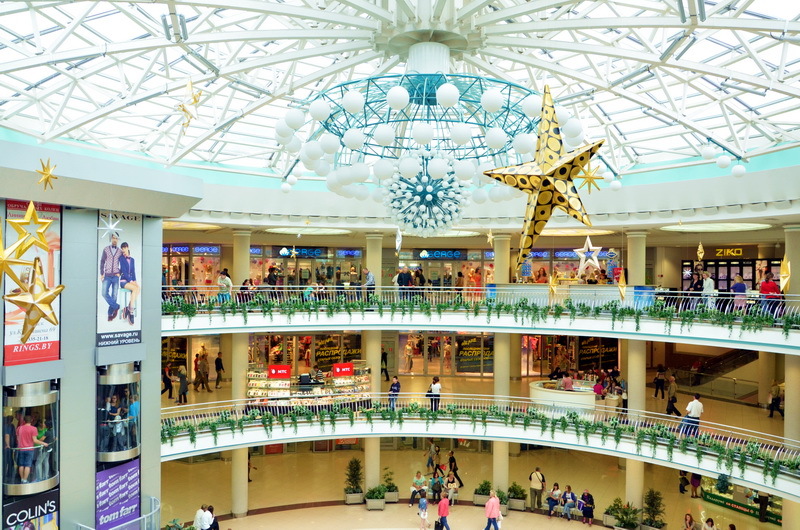 In 1793, according to some records, this was an area which contained a Town hall, a shopping arcade, two monasteries, local homes and retail shops . 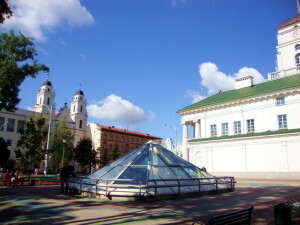 Today in Cathedral Square there is the city Hall (Ratusha) restored in 2003. A small glass pyramid at street level allows you to view the underground cellars of the city Hall. 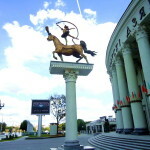 The first Governor of Minsk in 1796 Zacharia Korneev loved his horses and cart so much that a bronze statue of horses have been erected next to the city Hall, which are also in memory of the fact that this was once a favourite parking place for horse drawn cabs who chased after rich clients before the advent of motor vehicles. It was interesting to learn that in the old days cab drivers had their own codes and rules, which were much more civilized than our cab drivers today. 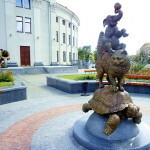 From this square you go across the oldest street in the city, Nyamiha street, named after the River Nyamiha in the 12th century and into the Avenue of winners, in the old days, this region was called the Tatar settlement. In the 15th century, captured Tatars settled here and were allocated the land to grow their produce. Another interesting instance of tolerance by the Belarussian people. On the far side of Nyamiha street is March the 8th Square, another historic city center where once the Minsk castle existed. This castle settlement first appeared in the 12th and 13th century and was originally known as the Lower market area. 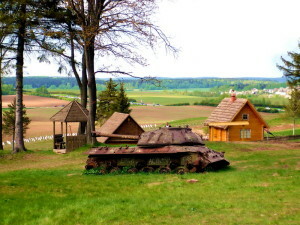 Most of the buildings in this area destroyed during WW2. Today it is called The Trayetskaye Pradmestsye on the Svislach bank after a church dedicated to the Holy Trinity that used to exist here. The area contains the remains of pre-WWII buildings has been renovated in recent times. 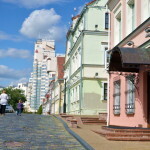 In 1985 the restoration of the old town cost 5 million USD (who said that Belarus is a poor country?) 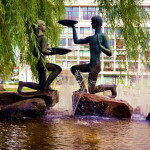 Today it has cafes, museums and antique shops. This is one of the favorite places for the locals and tourists alike, as the reconstruction of the 19th century buildings is such that one cannot help being fascinated by their beauty. Wander around these streets and enjoy the atmosphere of ancient times, some of the cobbled streets have been paved over with asphalt, but you can still feel the spirit of the time allowing for modern times and today’s technological progress. 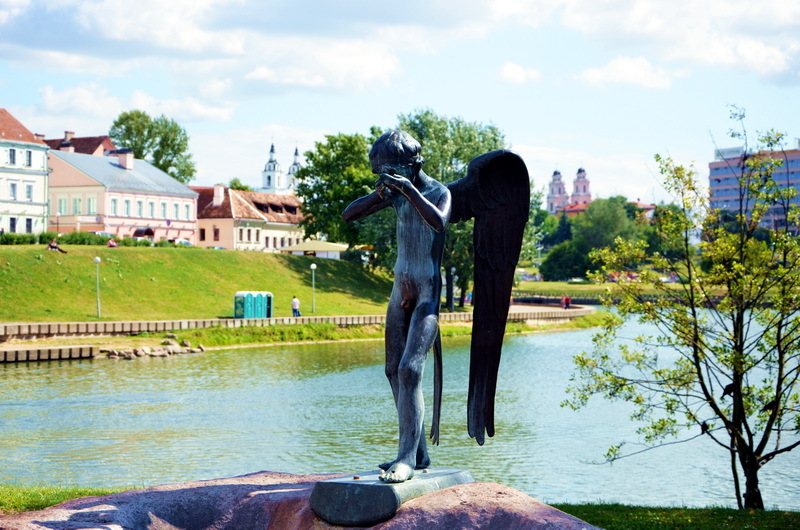 Over a small bridge across the river Svislach you will find the Island of Tears with a monument of a crying angel who failed to save his soldiers, dedicated to the memory of Belarusian sons killed in the Afghan war. 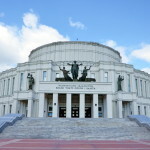 Go along Bogdanovich street where there was once the Trayetskiy market, this was replaced in 1933 by another major architectural creation, the National Academic Bolshoi Opera and Ballet Theatre of the Republic of Belarus. During the war, this building was sacked by the German occupiers and they erected stables in the remaining areas . 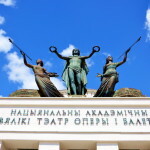 After the war, it was renovated and recently the sculpture of Apollo with flying nymphs has been placed on the top of the facade flanked by statues of Melpomene patron of the arts, Polyhymnia patroness of poets and dance. 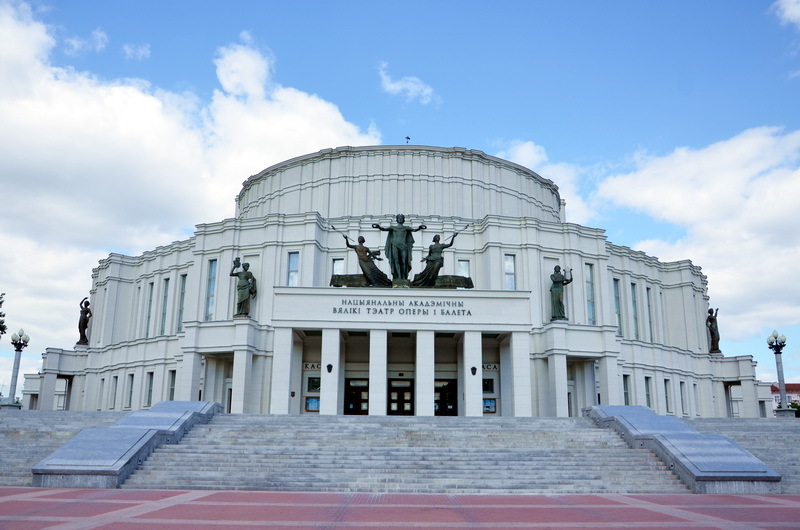 The theatre is surrounded by a magnificent park, nearly half of the city is covered by park land, Minsk is one of the greenest cities in Europe. 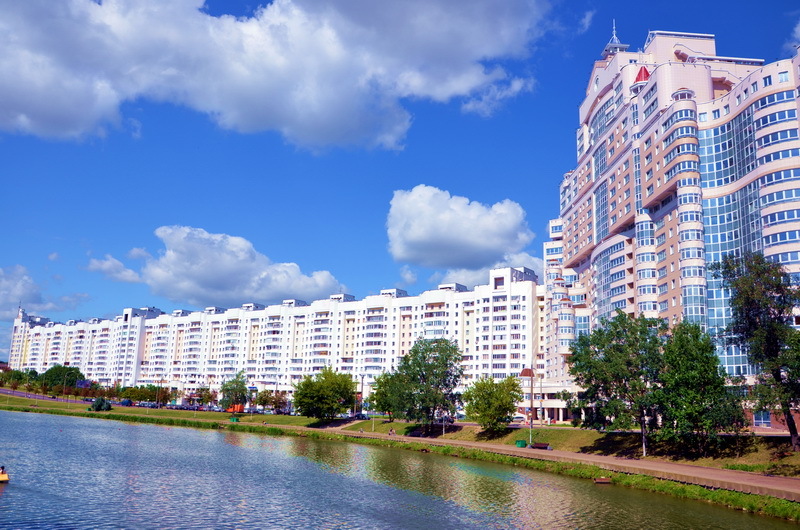 Not far from The Trayetskaye Pradmestsye (Suburb) is Storozhevskaya street with it’s modern skyscrapers. 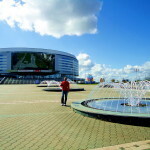 Minsk has a further three beautiful squares, from the Opera House you can go along Independence Avenue to reach the main square, where the Palace of the Republic and the Palace of Trade Unions are situated and recently installed is a “zero kilometer” which tells you how far other cities are from the square. 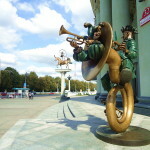 Continuing along Independence avenue you go past the Circus, a great big circular building with funny sculptures of various figures and animals. Further along the Avenue you will reach a large roundabout with an eternal flame at the base of the Victory monument in memory of World war 2, where today, newlyweds traditionally lay flowers. 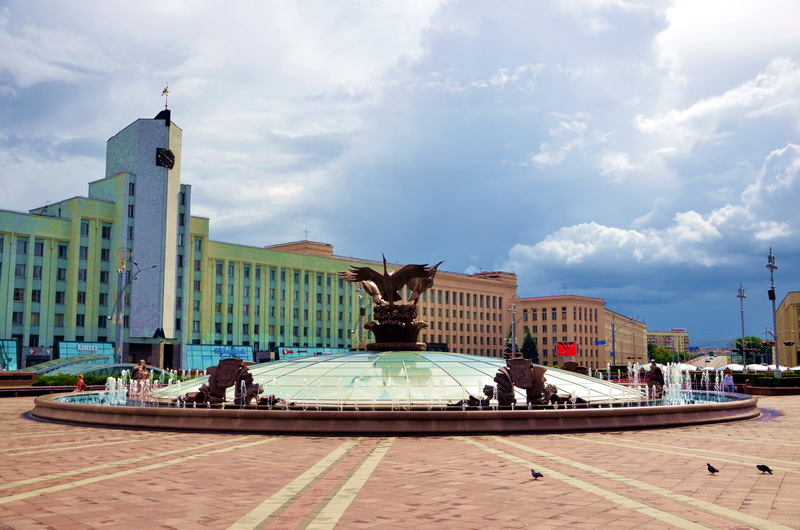 At the far end of Independence avenue, which by the way is one of the widest streets of Europe and flanked by Stalinist architecture, we reach the Yakub Kolas square. 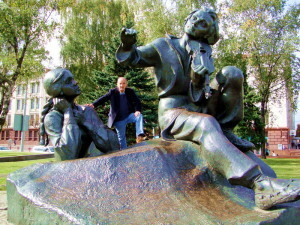 Yakub Kolas is the national poet of Belarus and in the centre of the square there are some monumental sculptures of the heroes from his works. 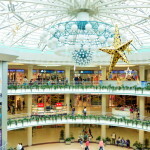 This is also the present cultural and commercial center of the city with a great downtown department store and the Belorussian State Philharmonic Society. 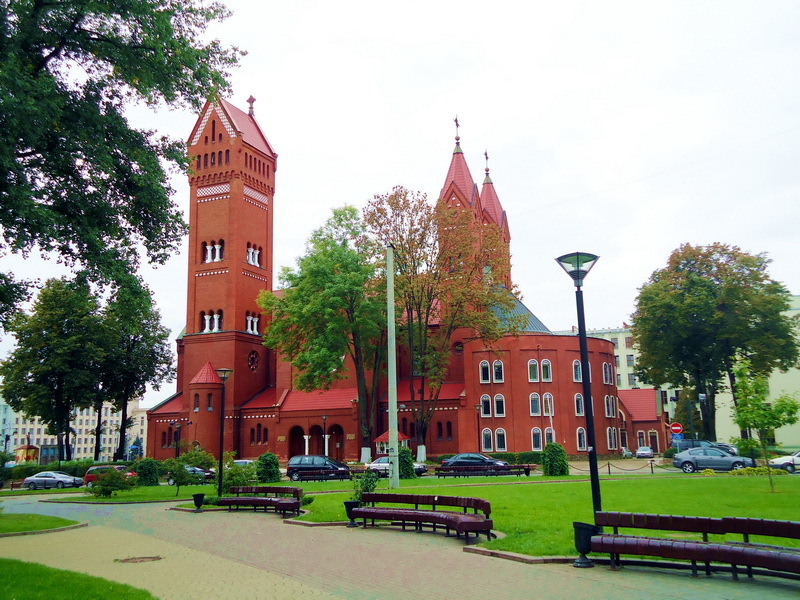 This area was called Kamarowka “Mosquito” in the old days, being originally an area of wetlands full of mosquitoes where poor people lived, hence the name of a nearby market called Kamarowski. Every capital of the world has its own unique building, creating a unique portrait of the city. 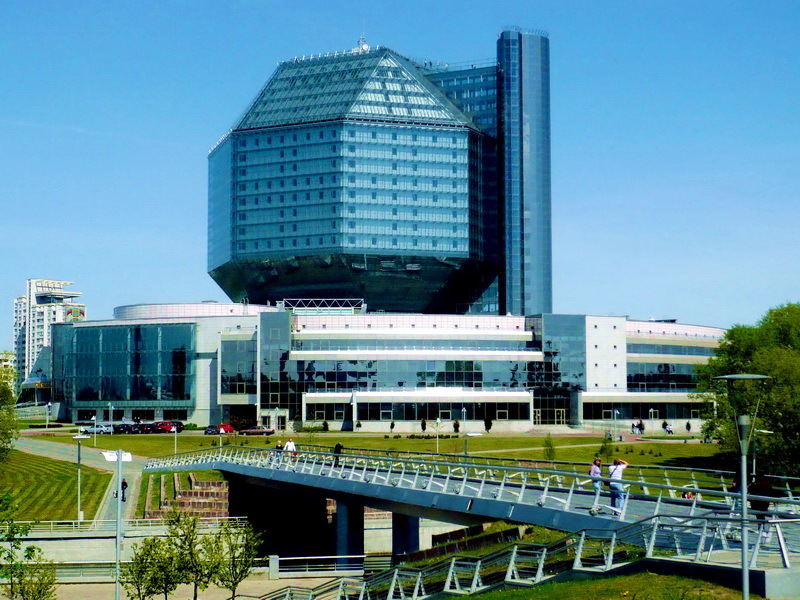 The pride of the Belorussian capital is the National Library of Belarus, built in 2006 and already portrayed as one of the most unusual buildings in the world. It is built in the shape of a Rhombicuboctahedron with a height 73.6 meters and is illuminated at night with clusters of LEDs which make vivid electronic paterns on it’s surface. 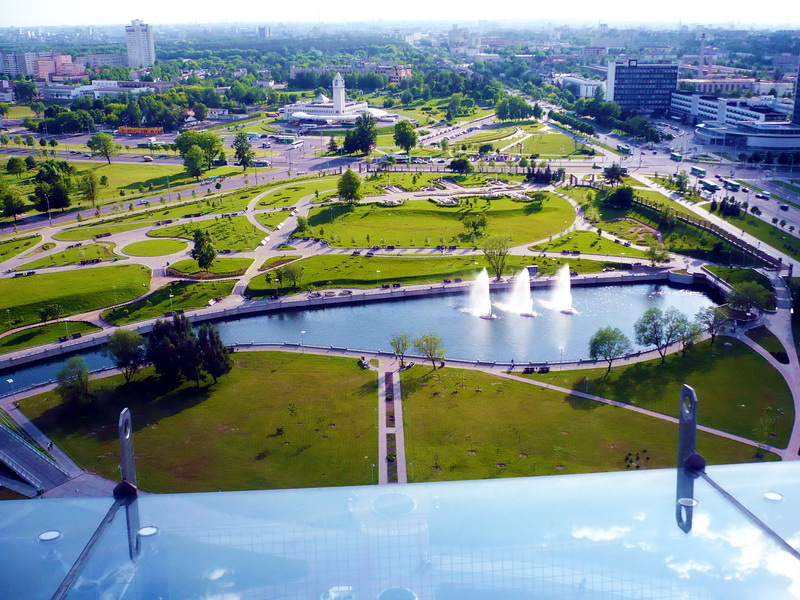 You can take the elevator to the observation deck, where you can view the green neighbourhood east of the city. 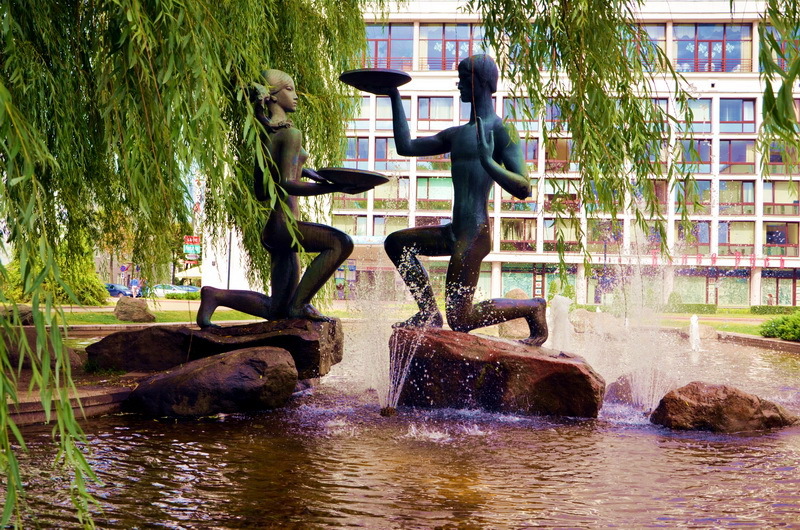 The park surrounding the library is full of artificial ponds and landscaped gardens. 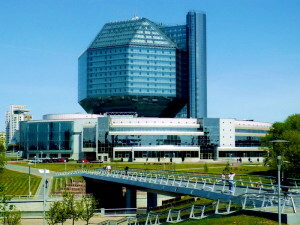 Rumor has it that all the residents of Belarus where forced to contributed towards the building of this library, when it became clear that there was not enough money in the treasury to complete it’s construction. Apparently, a percentage of monies was deducted from their salaries in relation to the level of their income. 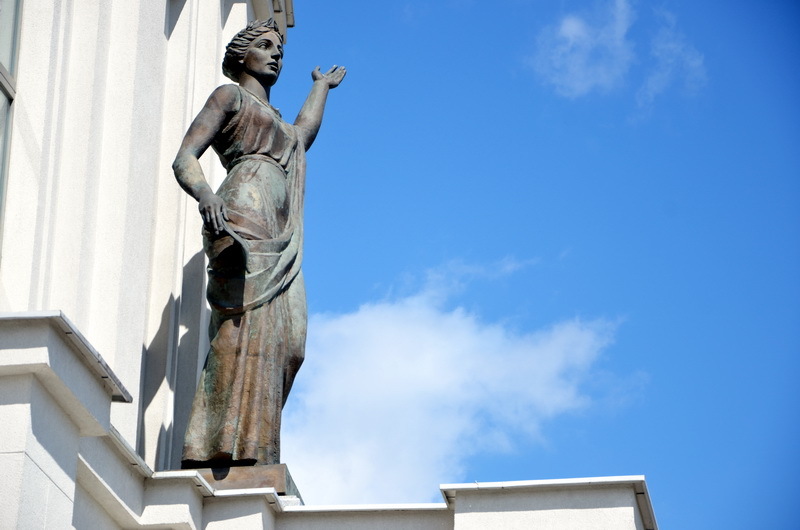 Objections were not considered or discussed as is always the case in Belarus today. 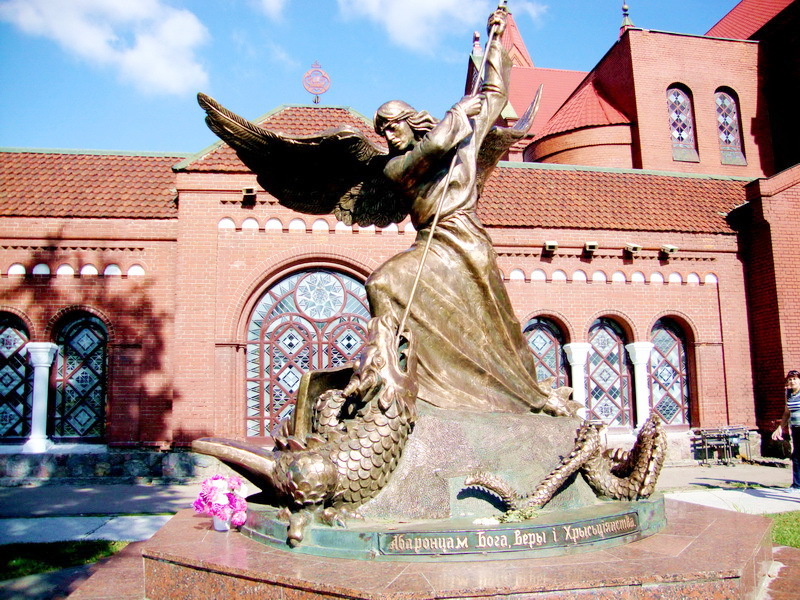 In the east of the city, you can visit to admire the beauty of the Church of All Saints honoring the memory of all those who served and died for the salvation of our Fatherland. 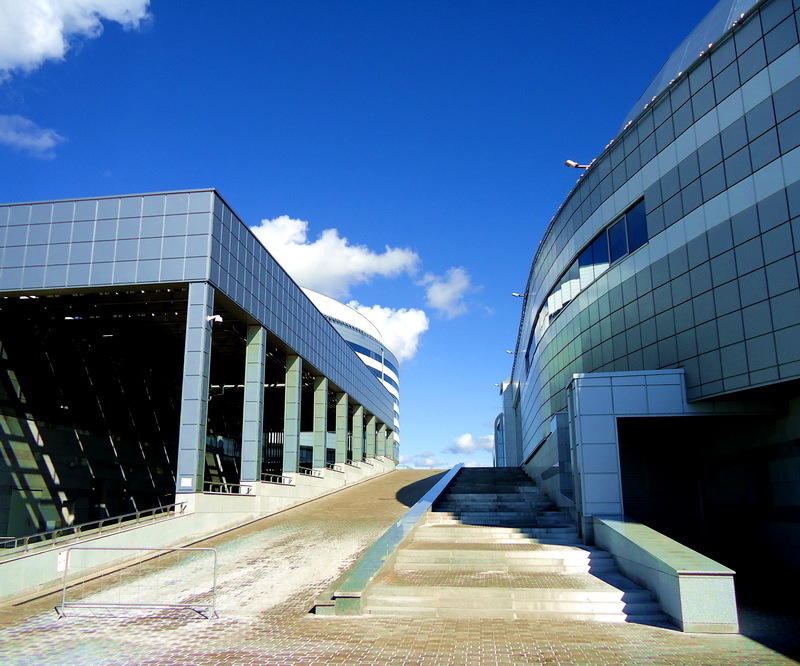 One newly listed building, is the ” Minsk- Arena“, a really nice and big sports facility, which will be the central venue for matches of the World Cup Hockey tournament of 2014. 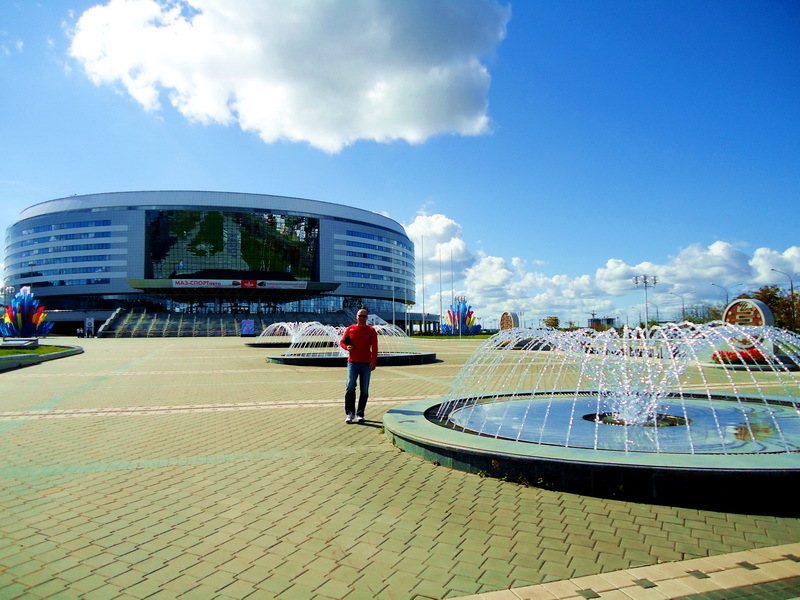 That’s all about Minsk for now until next year when I will definitely be back to bring you more stories and photos. My thanks to the authors of the website “Minsk old and new” where I discovered many interesting facts about this wonderful city. 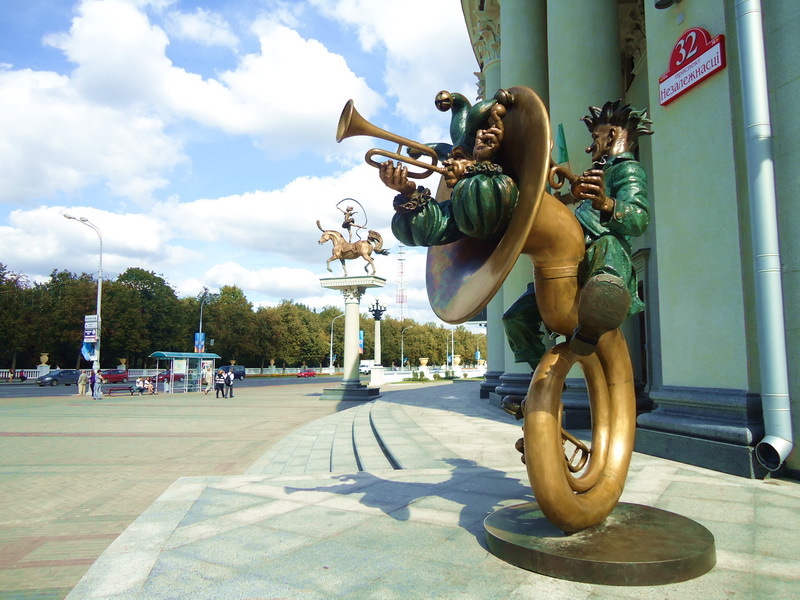 This entry was posted in History&Towns&Castles&Palaces&Museums, Photo gallery and tagged Minsk capital of Belarus. Bookmark the permalink.